This book presents everything the nurse and nursing student needs to know about how drugs act and interact in the treatment of disease. The book focuses on mechanisms of drug action; details specific drugs by pharmacologic class; reviews the nursing process related to each drug category for all body systems, plus pain medications, anti-infective drugs, and cancer drugs; and highlights potentially dangerous interactions, including drug-herb interactions. Prepare to administer drugs safely by mastering key pharmacology concepts and drug calculation skills! 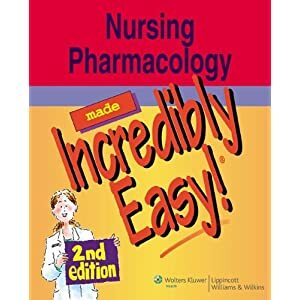 Pharmacology: A Patient-Centered Nursing Process Approach, 8th Edition covers nursing pharmacology within a real-world nursing context. Using a clear, streamlined approach, this text makes it easier to understand pharmacology with a detailed unit on dosage calculations, a nursing process framework for drug therapy, and summaries of prototype drugs. Written by nursing educators Joyce Kee, Evelyn Hayes, and Linda McCuistion, this edition includes a strong QSEN focus, enhanced coverage of prioritization, and more NCLEX#65533; Examination-style questions on the subject of pharmacology. NEW QSEN focus emphasizes patient-centered care, safety, quality, and collaboration and teamwork. NEW content covers the most commonly used drugs, including updated Prototype Drug Charts and drug tables. Enhanced coverage of prioritization includes nursing interventions in the Nursing Process sections listed in order of priority. Updated illustrations include new drug labels in the Drug Calculations chapter. "...provides appropriate chemical, biological, and physical information of the actions, interactions, and reactions of medication, particularly as they apply and impact the practice of nurse anesthesia. Written by CRNAs for CRNAs, the information about various drugs is based on theoretical aspects based in chemistry, biochemistry, biology, and physics/biophysics and practical aspects straight from actual CRNAs who administer and deal with the medications on a case-by-case, daily basis." This is a 'point-of-care' resource that offers professionals access to over 3,200 topics updated daily. The focus is evidence-based patient care. This link is available to Gannon students, faculty and staff only. One of the unique tools provided is a 'Calculators' link that lets you do various functions including medical equations, unit and dose conversions, decision trees, and search by specialty. This data is taken from the DynaMed link on EBSCOHost. "Drugs.com provides accurate and independent information on more than 24,000 prescription drugs, over-the-counter medicines and natural products. This material is provided for educational purposes only and is not intended for medical advice, diagnosis or treatment." There's a 'Pill Identifier' tab that lets you identify a medication based on physical criteria. More information on this all-inclusive medical web site can be found on the Online Healthcare Guides page in this research guide. More information on this meta-search database can be found on the Online Healthcare Guides page in this research guide.